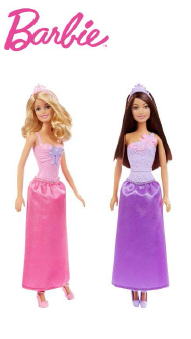 These pretty Barbie® princess dolls are dressed in gorgeous gowns for royal occasions and endless storytelling fun! Each is ready to rule in a beautiful bodice with signature detail and a matching skirt with rich satiny sheen. Choose from a princess in pink with purple bow detail or a princess in purple with pink adornment. Matching shoes and princess tiaras complete the royal looks. Enter your own fairytale kingdom with these graceful princesses! 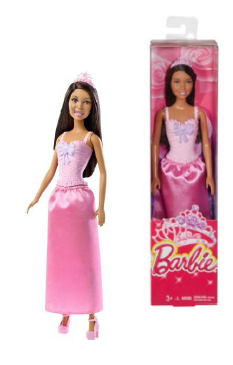 Includes Barbie® princess doll wearing fashion and removable accessories. Dolls cannot stand alone. Barbie® doll and her friends always love a beach day! And dressed for the water, they are ready for summer fun! This doll looks sun-sational wearing a fabulous patterned one-piece swimsuit that is right on trend and so her style. Girls will love playing out beach days, pool parties and summer vacation with this adorable doll. 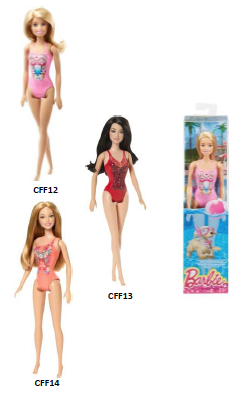 Includes doll wearing non- removable swimwear. Doll cannot stand alone. Dream big with Barbie® career dolls! Barbie® doll can take on any goal, and these professionals are aiming for the top. 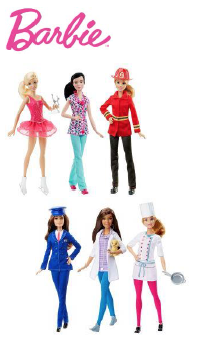 Each doll wears a career-themed outfit and comes with accessories that enhance storytelling -- like scrubs and a stethoscope for the nurse and a chef’s hat and frying pan for the chef! Explore careers in science and medicine -- there’s a pet vet and nurse. Take to the skies as a pilot; and go for the gold with an ice skater; feed the world as a chef, or save it as a firefighter. Different body types, skin tones, eye colors and hairstyles add to the possibilities and aspirational fun. Explore them all because with Barbie®, you can be anything! Includes doll wearing fashions and accessories, plus career-themed pieces. Dolls cannot stand alone. Colors and decorations may vary. Fans of the film BarbieTM in Rock ‘N Royals will recognize these junior camper dolls, ready to rock with their glam musical instruments! 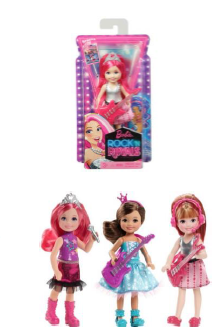 Choose from a princess pop star in pink with hot pink hair and pink guitar, a princess pop singer in blue with a pink crown headband and purple guitar and a junior rocker with pink headset and silvery microphone. All three wear adorable outfits with iconic touches, like bows for the princess pop stars and stars for the rocker. Recreate favorite moments from the film with these fabulous pop star dolls or play out new performances and stories! 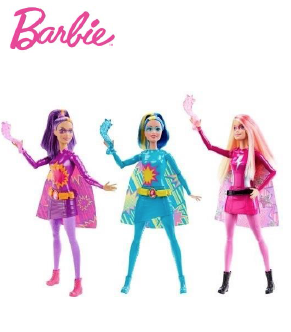 Inspired by unique super powers, these Barbie® hero dolls wear looks themed to match their talents. Choose from a hero who uses fire, water or power. Fashions include bold designs, bright colors and matching capes. Super fun accessories highlight super amazing powers. Dolls cannot stand alone. This pretty Barbie® princess doll is dressed in a gorgeous gown for royal occasions and endless storytelling fun! She’s ready to rule in a pretty pink bodice with purple bow detail and a pink skirt with rich satiny sheen. Matching pink shoes and a princess tiara complete the royal look. Enter your own fairytale kingdom with this graceful princess. Includes Barbie® princess doll wearing fashion and removable accessories. Doll cannot stand alone. Colors and decorations may vary. Disney’s Minnie Mouse is such a sweetie, and you can help her look her best no matter where she’s going. Dress Minnie any way you want with her stylish snap and fit fashions. 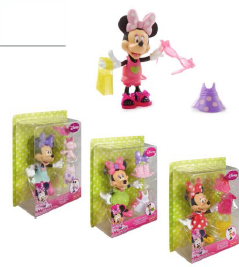 Each doll in this assortment includes a 5-inch (12.7cm) plastic Minnie figure that you can dress with her easy snap-on outfits. Minnie comes with 2 snap-on dresses, a matching snap-on bow, and 3 fashion accessories - everything you need to dress up Minnie! Discover a whole new world at Ever After HighTM with the Forest Pixies. In the epic Netflix Original Series Dragon Games, the fairytale students at Ever After HighTM find adventure in the Enchanted Forest where they meet the cute-sized Forest Pixies. These mystical protectors of the forest creatures are magical and have natural charm. Choose from FeatherlyTM, the Bird Forest Pixie; DeerlaTM, the Deer Forest Pixie; and HarelowTM, the Bunny Forest Pixie. Each looks darling dressed in her signature look with accessories inspired by the animal she protects. Kids will love telling new epic tales of their own with these magical creatures! 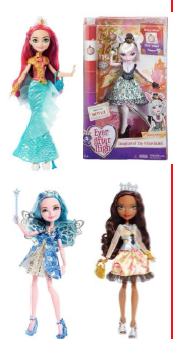 Includes Forest Pixie doll wearing fashions and accessories. Dolls cannot stand alone. Colors and decorations may vary. Discover a whole new world at Ever After HighTM with the Forest Pixies. In the epic Netflix Original Series Dragon Games, the fairytale students at Ever After HighTM find adventure in the Enchanted Forest where they meet the cute-sized Forest Pixies. These mystical protectors of the forest creatures are magical and have natural charm. Choose from FeatherlyTM, the Bird Forest Pixie; DeerlaTM, the Deer Forest Pixie; and HarelowTM, the Bunny Forest Pixie. Each looks darling dressed in her signature look with accessories inspired by the animal she protects. Kids will love telling new epic tales of their own with these magical creatures! 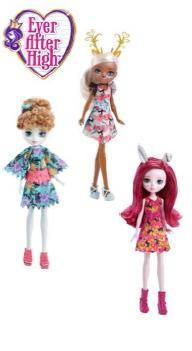 Includes Forest Pixie doll wearing fashions and accessories. Dolls cannot stand alone. Colors and decorations may vary. Welcome the “boo” students of Monster HighTM! This Scare- mesterTM, three new ghouls will enroll at the iconic school. Batsy ClaroTM, daughter of the White Vampire Bat, will be flying in from Costa Shrieka; Isi DawndancerTM, daughter of a Deer Spirit, will dance her way from Boo Hexico; and Kjersti TrollsønTM, daughter of a Mountain Troll, will come out from behind her game console in Goreway. Each doll wears a gore-geous outfit that fans will recognize from webisodes. The fashion looks show off their trendy teenage styles with classic icons representing their unique scaritages. To-die-for shoes, uhhh-mazing accessories and a freaky fabulous travel bag complete the killer styles. Each doll also comes with a SkulletteTM-shaped hairbrush, doll stand and diary documenting her most frightful experiences. Includes doll wearing fashion and accessories, bag, brush, doll stand and diary. Dolls cannot stand alone. Colors and decorations may vary. Ghouls like to groove, and a music festival is sure to be a howling good time, especially with backstage passes! Clawdeen WolfTM doll is ready to rock and roar in an R&B- inspired jumpsuit with furrific moon and wolf detailing up the side. The “clawesome” cat suit is purrfectly accessorized with tall golden boots, black belt, one faux leather fingerless glove and golden jewelry (bracelet and earrings). She'll be dancing all night long and continue the fun after the concert is over - Clawdeen doll also has a VIM (Very Important Monster) badge to get her backstage. Doll cannot stand alone. With UV light hair effects for her specially treated hair, Frankie SteinTM doll is ready for your electrifying hairstyle! Young stylists can use the Monster HighTM UV light tool and included stencils to create voltageous looks for Frankie SteinTM doll. The daughter of Frankenstein has uniquely treated hair so that the pink streaks on her head and the two colored hair extensions included within the set (one yellow and one blue) are UV light sensitive. Place a sensitive section of hair within the silvery UV light tool, designed to resemble a flat iron, and hold inside for a few seconds to create designs. Choose from one of the enclosed stencils that feature designs inspired by iconic Monster HighTM symbols and Frankie’s scaritage, like stitches or lightning bolts. Use one or both extensions. Add one icon or many. Style a look and let it shine to admire your work. Frankie SteinTM doll is ready to come to life in a dress with blue plaid and bright blue booties -- tell a tale or snap a picture (a doll stand helps hold scary cool poses to showcase your styles). Then let the effects fade out with exposure to light, brush using the SkulletteTM-shaped hairbrush and start again to create a whole new look. The possibilities for creativity and expression are endless! Includes Frankie SteinTM doll with special hair wearing fashion and accessories, the UV light tool, two treated hair extensions, stencils and doll hairbrush. Doll cannot stand alone. Colors and decorations may vary.